A DAX Puzzle is a problem that you can find in the real world related to BI technologies such as DAX and Power BI. Test your skill and try to solve it, then see our experts solution! DAX has an internal tracking of physical columns (lineage) that keeps references to original columns after certain transformations applied in a DAX expression. In this puzzle, you have to predict the result of two similar DAX queries. 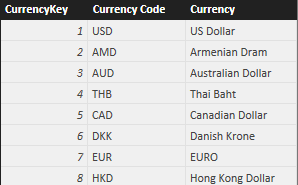 The data model has a simple Currency table with three columns: CurrencyKey, Currency Code, and Currency. If you create a calculated table based on such expression, what is the result? You can download the sample file and execute the query, but in this case we suggest you to not do that until you formulated your answer (and explanation). "Another", Currency[Currency Code] & ""
Again, what is the result? Once you formulated your answers, you can try the expressions in the sample file and view the solution. If the result of the query is not what you would have expected, spend some time trying to figure out why it was different. The puzzle is all about your understanding of data lineage and filter context in DAX. Moreover, think carefully about the result of each function included in the expression. To see the solution, just press the button below. The zip file include a sample report in Power BI Desktop containing a data model with the scenario and the starting point for the challenge. Please, use comments here only for discussions about the scenario and do not post a possible solution. Use the comments area in the solution page to post your alternative solutions.